Often when people call Landmark they ask how difficult inflatables are to set up. We usually tell them that basic installations require one to two people. Now, I'm not a large woman and I was able to do these set ups and take downs with minimum assistance. Don't get me wrong, I probably wouldn't attempt a rooftop installation alone and I'd certainly advise a do-it-yourselfer to get professional help for their first install. As for tradeshows or ground installations, however, it's a very simple process and I was out to prove that once and for all. My mission? 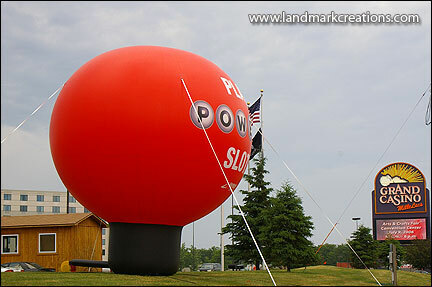 To set up two inflatable lotto balls for one of our gaming customers who is doing a promotion for Powerball Slots at Grand Casino in Mille Lacs and Grand Casino Hinckley. The inflatable draws attention to their promotion from outside the casino and reinforces the brand in an environment where competition for attention is extremely high. When I arrived at the first job, I was sure the grounds manager thought he was on Candid Camera. He was expecting a big truck with half a dozen brawny guys to show up and he got neither. He barely believed me when I said I was the only one on "the crew" and that the balloon was in the back of my SUV. At 115-pounds, the balloon weighed almost as much as I did! I pulled the Powerball from my truck and began the process by the book (a.k.a. our installation guide). I sorted through my parts and pieces (everything you need for installation is included) then looked for a good location, an electrical source and the best anchor points for the balloon. I got it out of the storage bag (by myself, thank you!) and positioned it to face the road. Next came the attachment of the tether straps. Here’s a tip for getting the inflatable to easily stand up and look great the first time. Find out which way the wind is blowing and keep the tether straps on the windward side somewhat tight. The straps on the opposite side should stay loose at the beginning of the inflation. As the inflatable fills with air, gradually release the tension on the windward straps and tighten the opposing straps. Using this method, the wind will help the inflatable stand up with minimal assistance from the installer. Finally, I attached the blower system, pulled her in and let her fly (well, in a manner of speaking). As usual, I got a lot of honks once the balloon was inflated. The guys who work maintenance at the Mille Lacs casino were very nice but also very skeptical about the whole thing. That is, until I turned the blower on and the giant ball emerged seemingly out of nowhere. Then I had a little respect from them. While inflatables may be massive in their size and powerful in their ability to attract attention - when it comes to installation - there's really nothing to it. Looking for more creative marketing ideas? Visit our online galleries! "Simply put, the bobbleheads were a real hit at TwinsFest. Over 21,000 fans attended the two-day event raising more than $100,000 for the Twins Community Fund charities."